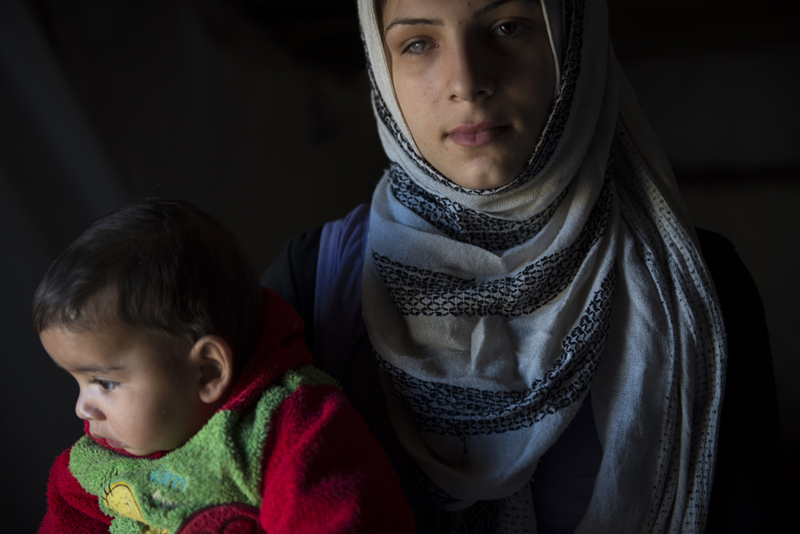 Raeda, 15, holds her six month old brother in the tent elevan members of her family is renting on farmland outside of Saadnayal, in the Bekaa Valley, in Lebanon, January 19, 2013. Raeda received shrapnel in her eye during an explosion near her house in Aleppo, Syria, and she can no longer see out of that eye. 'We have been thrown into worry before we even knew what worry was,' Raeda says, while caring for her younger siblings. Lebanon has been avoiding setting up typical tent camps for refugees in the manner Turkey and Jordan have done, and so refugees are forced to live underneath commercial buildings, in makeshift tents, and with families around the country. According to the United Nations High Commission of Refugees, roughly 200,000 Syrian refugees have already been registered in Lebanon; there are a presumed thousands who are awaiting registration.